Manufacturer of a wide range of products which include universal tilting rotary furnace, lead recycling horizontal rotary furnaces, aluminium recycling rotary furnace and tin recycling rotary furnace. 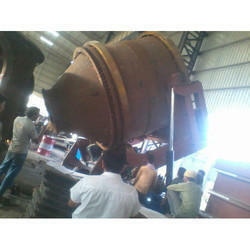 We offer Universal Tilting Rotary Furnace to our clients. robust MS structural frame and driven by a gear & motor arrangement. The shell is lined inside with insulation and fire bricks of suitable Alumina content. Conical ends of the furnace are open on both sides. The furnace is charged with Raw material along with additives from the front end. This side is provided with a movable door on which a burner is mounted. The burner can be a conventional one or a fully automatic one depending upon the fuel used. At the other end, an exhaust block lined with refractory bricks is provided. A tapping hole is provided in the center of the shell from where molten metal & slag are discharged. Flue gases generated are sucked from the exhaust block side of the furnace. Ingot Casting machine for Secondary Aluminum Recycling. Aluminium Recycling Rotary Furnace is designed like a rotary closed well furnace. It has advantages of rotary furnace, rebvetory furnace and dry hearth furnace in a single equipment. Main advantage of UTRF is that it can be rotated as well as tilted. Firstly lead scrap is loaded in furnace with smelting flux and furnace locked. The material is heated with the help of oil/gas burner which is mounted on the door, until it reaches melting point. Heating is immensely faster because of horse shoe flame design. Due to the quick heating, consumption of oil and melt loss is very less as compared to the conventional tube furnace. Less amount of flux is required for melting. All non ferrous scrap can be recycled in a single unit. Homogenous charge resulting in high quality of material. Recurring cost is approximately 30% less as compared to horizontal rotary furnace. The traditional furnace (fixed axis rotary furnace) is primarily a rotating tube with burner on one end and flue at the other. The furnace functions under negative pressure and gets cold air from outside making it virtually impossible to control the atmosphere in the furnace, which is nearly always oxidising ( air rich). It view of it, large amount of flux is required to protect the charge. Consumption of oil is also high because travel length of flue gas is less. 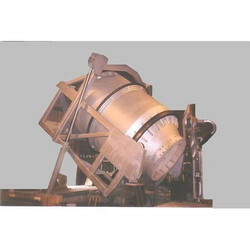 On the other hand, UTRF furnace is designed with a single entrance and exist point. The door carries burner and flue. The furnace operates under positive pressure and during firing of the burner there is complete absence of cold air from outside resulting in reduced amount of flux required during operation. In addition the furnace operates at an angle, the charge is mixed with similar action that of a concrete mixing machine. This improves homogeneity heat transfer resulting in high thermal efficiency. Tap to tap cycle time 4- 5 Hrs. Oversize driving system and bearings. Tilting, door opening and closing is hydraulically operated. Sturdy inte4rlocks for safety of the equipment. Less manpower required. Only two persons per shift can operate the furnace. 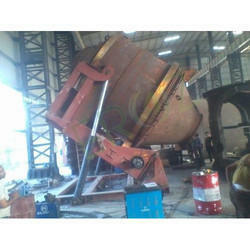 Tin Recycling Rotary Furnace is designed like a rotary closed well furnace. It has advantages of rotary furnace, rebvetory furnace and dry hearth furnace in a single equipment. Main advantage of UTRF is that it can be rotated as well as tilted. Firstly lead scrap is loaded in furnace with smelting flux and furnace locked. The material is heated with the help of oil/gas burner which is mounted on the door, until it reaches melting point. Heating is immensely faster because of horse shoe flame design. Due to the quick heating, consumption of oil and melt loss is very less as compared to the conventional tube furnace. The traditional furnace (fixed axis rotary furnace) is primarily a rotating tube with burner on one end and flue at the other. The furnace functions under negative pressure and gets cold air from outside making it virtually impossible to control the atmosphere in the furnace, which is nearly always oxidising ( air rich). It view of it, large amount of flux is required to protect the charge. Consumption of oil is also high because travel length of flue gas is less. On the other hand, UTRF furnace is designed with a single entrance and exist point. The door carries burner and flue. 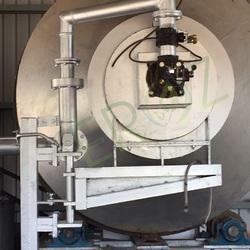 The furnace operates under positive pressure and during firing of the burner there is complete absence of cold air from outside resulting in reduced amount of flux required during operation. In addition the furnace operates at an angle, the charge is mixed with similar action that of a concrete mixing machine. This improves homogeneity heat transfer resulting in high thermal efficiency.